Distinctive pottery made by the Martin Brothers of England from the 1870s to 1915 is featured in a sale report in Kovels On Antiques & Collectibles April 2019 newsletter. Martinware, as pieces are known to collectors, was made mostly of salt-glazed stoneware and prices for their grotesque bird-like creatures called “Wally Birds” fly high. Kovels’ pictures the Wally Bird tobacco jar that auctioned for $37,000 along with other pricey Martinware examples. Baker Furniture Co. has a rich tradition, making authentic reproductions that stand the test of time. Their workmanship is so good they have been asked to copy and repair museum-quality pieces. A recent Detroit auction proved Baker’s continued collectability and Kovels’ April newsletter pictures vintage Baker chests, cabinets and tables with prices. Also find the coordinating April Dictionary of Marks illustrating and dating Baker markings through the years. Autographed baseballs are always a home run for sports-crazy collectors. As the baseball season gets underway, Kovels’ reports on autographed baseballs recently auctioned in Dallas. See baseballs signed by notable New York Yankees, Detroit Tigers and others in Kovels’ latest issue. Royal Doulton is still found in many homes and some classic pieces auctioned in Kansas caught Kovels’ eye. Vintage Royal Doulton from Bunnykins to Sung Ware with figurines and flambe in between are pictured and priced in the April newsletter. Circus memorabilia is always a hit and Kovels’ pictures nostalgic remembrances of circus days gone by. Examples in the latest newsletter include a Ringling Bros. and Barnum & Bailey circus wagon wheel, a carousel panel and performer’s garb along with selling prices from the Florida auction. And Kovels’ can never feature enough costume jewelry – this time from an Indiana auction that offered hundreds of marked pieces by midcentury makers such as Schiaparelli, Kenneth Jay Lane, Miriam Haskell and others. The Kovels go “on the road” to Miami Beach to explore the Miami Beach Antique Show. Kovels’ popular illustrated Collector’s Gallery answers readers’ questions about a Royal Bayreuth bowl, an ironstone pitcher, a souvenir silver tower box and a Bavarian porcelain dish. And more than 70 antiques and collectibles are listed in the April Buyer’s Price Guide. 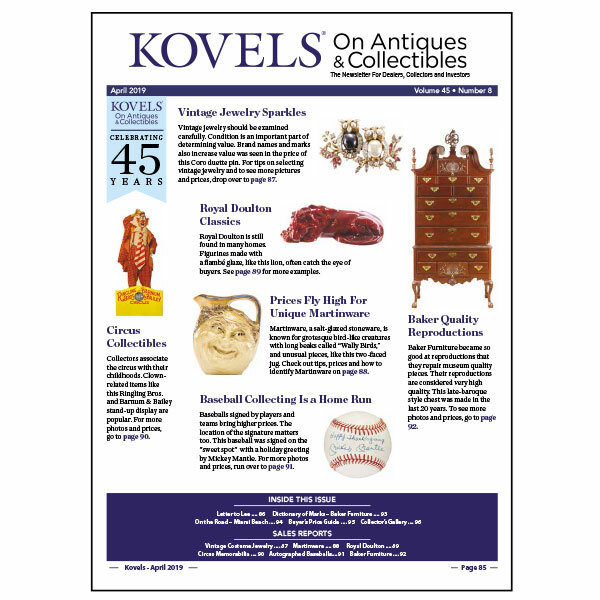 Kovels On Antiques & Collectibles is available as a print subscription, or as a digital version that is part of the Kovels.com Premium subscription.